invitation printing, originally uploaded by ordinarymoment. Of course, the invitations to a wedding really set the mood + help give your guests an idea of what to expect. We found a lovely location at the local nature center that was reasonably priced AND available on such short notice. We wanted our invitations to have the same earthy, organic feel as our wedding setting and to have a handcrafted look. A while back Matt had spotted a vintage Italian kids’ toy at a church rummage sale: a “printing press” to create your own newspaper. He stashed it away knowing someday he could make something pretty cool with it. It consisted of a few metal printing blocks (next to the stamp pad above) with which you had to carefully tweeze tiny little rubber individual letters + punctation into each line. Yes, it was tedious. 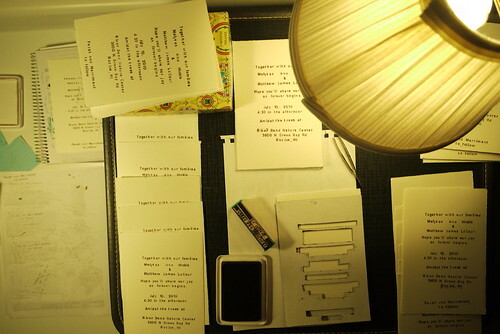 Yes, we considered scrapping the whole diy invite idea after painstakingly laying out each line + creating paper shims so that each letter would print evenly on the cardstock. There were only so many of each letter, so we also had to very very carefully choose our words, keeping it as concise + informative as possible. Phew. You can see the little cardboard guide Matt made to be sure the stamps lined up ok on each invite. In the end, I loved how each invitation had slight variations in color + type. Definitely a once-in-a-lifetime project.